Here’s another photo of the Birdcage Panel that shows more of the unusual figures that are found here. 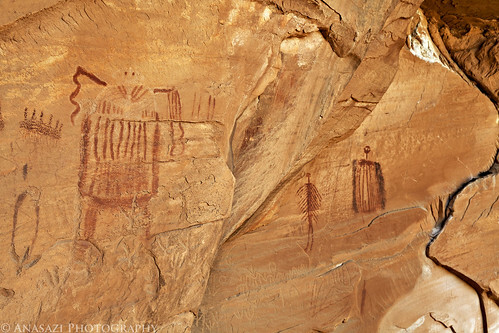 These are the three most prominent figures found at the site. The one on the left looks like a birdcage (or R2D2) which I believe is how this panel received it’s name. There’s also a few bird feet petroglyphs pecked into the wall which could have also helped with the name of the site.